Dimensional variability. Random splits. Surface waves. Any or all of these can cause big production headaches. Scrambling to fix the problems can lead to a host of other issues. The best time to address problems is before they occur—an ounce of prevention as they say. But how do you know where to focus your up-front efforts? After all, we already are late with tooling buyoff and we need to ship the tools to the home line. 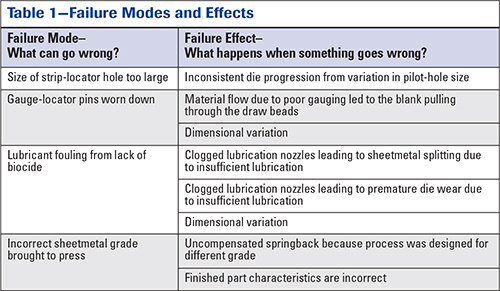 FMEA, or failure modes and effects analysis, can help align your efforts with the issues that can cause the most problems. FMEAs are created before production and rely on your experience with similar parts. Rather than only highlighting the consequences of failure, following this discipline helps prioritize the issues that represent the biggest risks to success. Key to FMEAs is the risk priority number (RPN), which results from multiplying the numerical severity, likelihood of occurrence and likelihood of detection ratings. Individually, these ratings can vary from 1 to 10. Failure modes with the highest RPNs must be attacked up front. Otherwise, you most likely will deal with them during production. First, we must identify what we are trying to achieve. Many MetalForming readers seek to produce production quantities of dimensionally accurate, split-free stampings from the full range of acceptable tensile properties associated with the ordered sheetmetal grade. Doing so requires many process steps. Raw-material receiving and storage, die setup, and stamping are just the high-level steps—each of these can be broken down into smaller actions that can interfere with the end goal. What can go wrong, and what happens when something goes wrong? Failures come in all degrees, with some more important than others. Here, we will not make judgments on the levels of importance or their frequency; instead, just focus on what could happen. Failure in this context includes any error or defect. A failure mode describes the way in which a failure occurs. A failure effect represents the immediate consequences of a failure on the operation, function or functionality of some item. Consider just one part of our overall goal: producing dimensionally accurate parts. In this step we define all of the failure modes arising from incorrect dimensions that could block us from reaching our goal. Each failure mode can bring several failure effects. Some failure modes and effects associated with incorrect dimensions include issues such as those shown in Table 1. Why these failure modes occur and how to address the root causes will be the subject of a future article. Severity assesses the seriousness of the effect should failure occur. 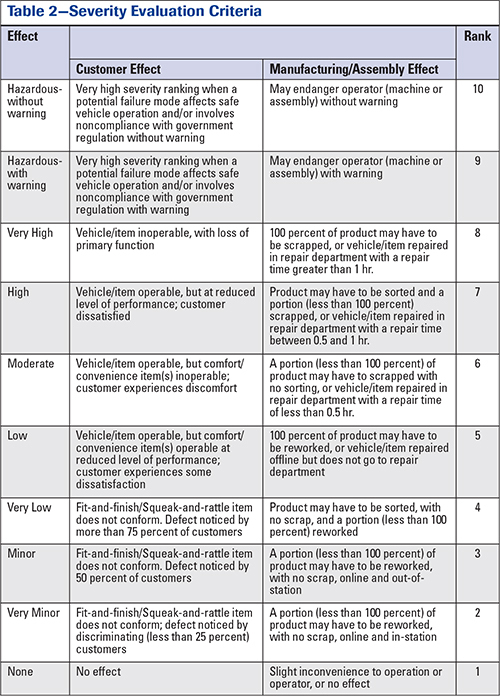 The highest severity ratings are given to those instances where failure leads to violation of safety or regulatory requirements, with the highest rating of 10 given for a catastrophic no-warning event. Even if the effect has relatively low values of occurrence and detection, those with high severity ratings should be addressed due to their implications. Table 2 lists possible effects, their severity and their ratings. The actual thresholds should be customized for your specific needs and concerns. The forecast was incorrect, so the correct material was not available when production needed to make parts. The assembled team should assign a ranking related to the likelihood that each of the potential causes will occur. A design or control change of potential causes represents the only way to change an occurrence rating. 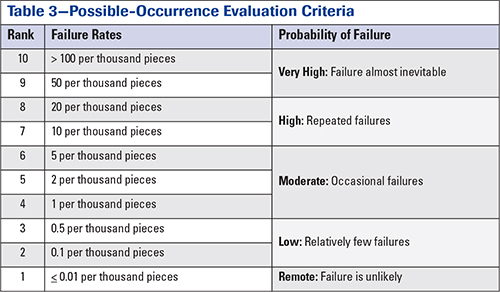 Table 3 lists possible failure rates and their ratings. As with severity ratings, the actual thresholds should be customized for your specific needs and concerns. Next, we list the controls in place to detect and/or prevent each of the failure modes. These can include placing a notch into the blank shape to ensure proper orientation; laser etching a barcode linked to tensile properties on the outer lap of every coil rather than relying on the oil-drenched paper certs taped to the outer lap; or scheduling a weekly call with a customer to gain insight on the latest usage forecast. If it occurs, are we likely to catch it before damage is done? Detection assesses the effectiveness of each design control. For example, having two operators check the certified metal properties helps to confirm that the correct grade will be processed, but this assumes that paper being checked is correct. Barcodes are great for tracking inventory, but only if the barcode isn’t crossed out with a marker without a corrected number written next to it (yes, this did happen). 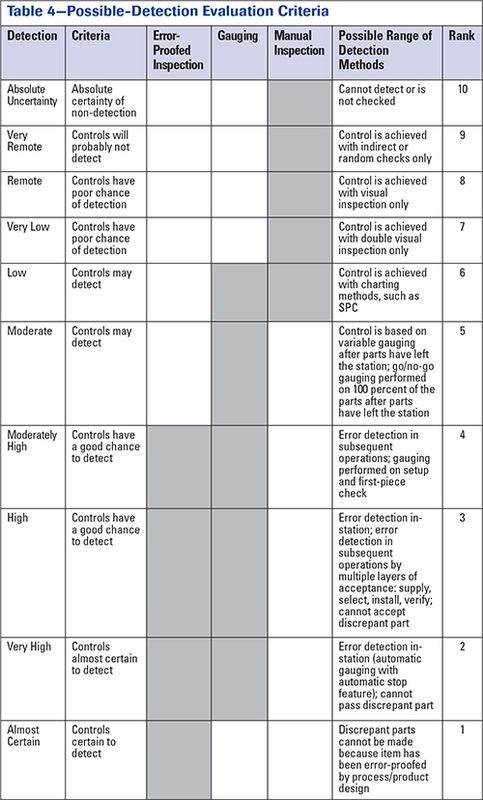 Table 4 lists possible detection criteria and their ratings. The actual criteria and ratings should be appropriate for your specific needs and concerns. RPNs vary between 1 and 1000. The highest RPNs help to define action areas. These efforts might take the form of testing, documenting, tracking, changing design, changing process or changing material—or undertaking many other corrective actions. Who’s on the FMEA Team? Maybe you’re a process engineer who has worked in several roles over the years and is pretty familiar with the steps involved in making a good part. Although your instinct may be to build the FMEA yourself…don’t. Consider a general contractor who knows how to build a house, but still brings in specialists to handle the plumbing, electrical and drywall. Remember, you aren’t trying to lay out all the steps to be successful—you and your team are trying to document all of the ways that you may be unsuccessful. Get as many disciplines as possible involved: receiving, design, tooling, manufacturing, assembly, reliability, quality and shipping all can have an impact. SAE International (standards.sae.org/ j1739_200901/) and the Automotive Industry Action Group (www.aiag.org/store/publications/details?ProductCode=FMEA-4) offer documents to guide metalformers through the development of FMEAs. Even though both organizations are automotive-focused, FMEA and other quality tools should be applied at companies of all sizes and industries as an effective way to improve first-pass quality and reduce costs.